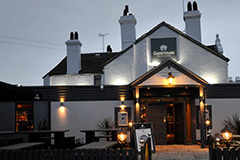 One of Prestatyn’s iconic pubs has been transformed into CookHouse, Pub & Carvery - a newly refurbished family-friendly pub, restaurant and carvery with a stylish and contemporary feel. There's something for everyone, of all ages at the CookHouse with breakfast, lunch, evening and childrens’ menus, not to mention an opulent choice of desserts. A unique feature of the business is a large rotisserie oven, from which customers can have a freshly roasted chicken delivered to their table. All can be enjoyed in a well-designed, relaxed and safe environment. 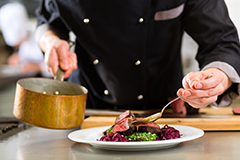 CookHouse offers delicious freshly cooked food, friendly service and great value. 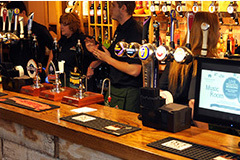 The bar has a wide selection of beers, wines and spirits to suit every taste, including a choice of craft beers. To enhance your visit we have a large, secure playground for your little ones, and for the adults there’s a monthly comedy night, showcasing 4 of the UK stand-up circuit’s finest comedians. Bookings can be made online, and are recommended for larger groups. CookHouse is an enjoyable mix of pub, restaurant and playground. Everything created with children of all ages in mind. See for yourself and try some family fun and food. CookHouse Pub & Carvery has beaten off competition from over 1100 pubs to be named Pub with the Best Outdoor Area in national awards run by Heineken owned Star Pubs & Bars. The judges were amazed by the pub’s ‘brilliant transformation’ and noted how CookHouse has created a beautifully planted garden complete with a safely fenced extensive children’s play area, seating for over 100 people to enjoy a meal or drink, no smoking area and giant umbrellas and heaters to enable the garden to be used year round. Watch this space with more additions to the children’s play area planned for the Spring.